From left: Grace Cauchi, Alan Tabone, Gino Cauchi, Marie Grech, Frank Camilleri, Francesca Muscat, Georgine Brown, George Attard and Katya Scicluna. The Gozo team is this year’s winner of the Frank Salt Real Estate Best Branch Award 2018, given in recognition of the branch’s efforts and outstanding performance in sales and leasing of property. The branch surpassed its targets for the year by a wide margin while also providing a top-notch service. 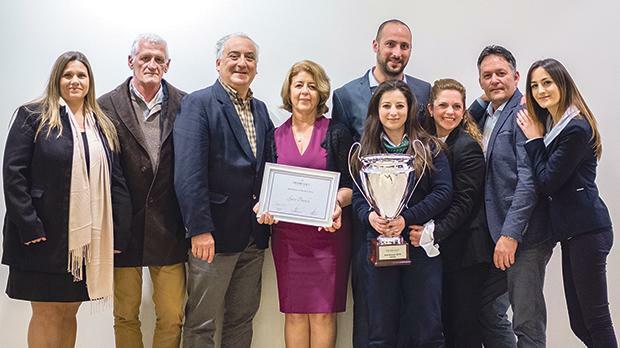 “I couldn’t be prouder of my team”, said Gozo branch manager Marie Grech. “It feels good to be recognised for all our hard work. Years of exemplary service, tireless dedication and commitment to offering the best possible service have paid off. The results are evident in the number of clients who keep coming back to us. Last year also saw the Gozo branch celebrate its 30th anniversary, so what better way to celebrate than to win this award,” she added. For 30 years, Frank Salt’s flagship branch in Gozo has been providing home buyers and sellers with a comprehensive service in property-related matters. Thirty years ago, Frank Salt Real Estate was the first Malta-based estate agency to see the huge potential Gozo had to offer and, while the journey was not always an easy one, the Gozo branch has reflected the brand values held dear by the estate agent’s 17 offices. “The Gozo branch has grown from a staff complement of two to nine, consisting of sales and letting consultants, support staff and property management and maintenance staff. Every member of the team takes pride in the Frank Salt brand values and give a warm, professional and honest service which has set us apart”, Ms Grech said. Frank Salt Real Estate offers further services to clients, providing a one-stop-shop concept, including property management and maintenance, holiday lets, pool servicing and property finishing and furnishing. While the Gozo branch celebrated its 30th anniversary, the Frank Salt Real Estate group has reached a major milestone this year, its 50th anniversary. What started off as a one-man show has now become a firm boasting a 200-strong team of agents under the guidance of the Salt family and fellow directors, backed by dedicated managers, agents and support staff who work hard to deliver a service like no other.